Quite likely the most recent heat wave has made it clear that summer is here, but truth be told I don't need summer as a reason to walk around in flops. I enjoy my flops year round. Certainly if you're a casual flop user; one who uses them only for pool / shower situations you can get away with any old flip flop, but if you put miles on your feet like I do in your flops then you need to carefully consider your flop purchases. Thong or Slider or Other: One of the first decisions to be made is whether to choose a thong type style which is the traditional flip flop style with a divider between the big toe and 4 other toes. One advantage of this style is that you are sort of able to grasp the flip flop with your toe to prevent if from flying off. I grew up wearing this style, but made the switch to the slider style. I find that if you walk long distances in your flip flops, even well worn thong style flip flops have a tendency to chafe between your toes and can cause blistering. Some flip flops and sandals have partially enclosed toes. I suppose you could envision this offering a degree of protection and they may perhaps be more acceptable in some environments such as some work places. I have worn this style on occasion, but it is not my regular flop of choice. The biggest issue I find with these partially enclosed flops is that I find they tend to allow small objects such as rocks, lawn debris, etc to get into the flop and unfortunately not exit easily. There is nothing worse than having to stop every few feet to remove an irritating rock from the inside of your flop. Color: Often flip flops are worn in the summer and it can get hot. It is amazing how hot an unattended flip flop laying in the sun can get. Indeed, I recently burned my big toe after inserting it into a navy blue flip flop that had been laying in the sun - ouch! In general, black and navy blue will absorb the heat and get much hotter. A white sole reflects back the heat and keeps cool much better. Unfortunately, when it comes to men's flip flops, "manly" colors are pushed and black flip flops and sandals are common. I was in a Big Lots last year and they had some men's slider style Crocs. 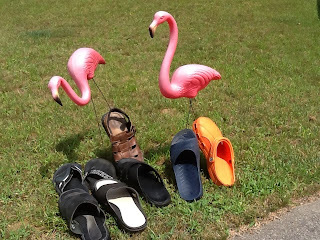 I would have snatched them up, but for one thing - they were hot pink. It's no wonder they wound up in this overstock store... I love my orange Crocs, but even I have my limits. Materials: Flip flops are offered in a wide range of materials including leather and the one piece rubberized style such as Crocs. Leather may be more acceptable in some social situations and workplaces. However, I have found that leather (and similar materials) are terrible for pool and beaches. Water seems to greatly shorten their life and wet leather can also give off an unpleasant stink. There are many Croc imitators. Some do a decent job and some don't. I recommend you carefully feel the flop - is it soft, smooth and pliable? Foot / Heel Absorption: One thing that has become more important to me as I've increased my wear time of flip flops is checking out the sole of the flip flop for absorption of my weight as I walk. The real Croc's are a good example of doing this well. They have a thick heel that absorbs your weight like a sponge. I also had a good experience with a Thom McAn flop / sandal that used air pockets in the sole to absorb the impact of a vigorous walker. I am price conscious when shopping, but there is a fine balance when it comes to products such as footwear, underwear and clothing in general. If it doesn't fit right or doesn't feel good while wearing it, it isn't a bargain at any price. I have been able to consistently find good fitting and functional flops and sandals staying within the $10 - $20 range... Happy flopping, all.